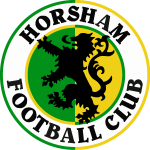 Welcome to the archive section of Horsham Football Club where it is our intention to create the biggest database of all things HFC, anywhere on the web. In the mid 1990s, former programme editor Adam Hammond took it upon himself to document the club’s history but was shocked to find that large chunks of its records had been lost or destroyed. Undaunted, what followed was endless hours spent in the archives department of the local library, sifting through years of reports, interviewing former players, buying up old items of memorabilia from auction houses and an all-round dedication that has provided the club with a very solid base from which to continue its research. Our immense gratitude goes to Adam for his tireless efforts. With Adam departing for pastures new, the challenge of continuing the task has been taken up by Mark Wells who has put together a large collection of match programmes dating back to the 1920s, as well as shirts, badges and assorted memorabilia, some of which you will find within the pages of this website. So whether you’re looking for past results and match reports, team line-ups, photographs, programmes or league tables, or just general miscellany, you’ll find it all here. The archive is split in to different sections covering each period of our history, from the West Sussex Senior League of the late 1880s through to the Isthmian League, with the full list of results displayed via the dropdown menu on the general fixtures page. A full menu of features can be found under the archive header at the top of this page. Where not available through the club’s official sources, match reports have been reproduced from those published in local newspapers such as the West Sussex County Times, to whom we are extremely grateful for their long-standing coverage of Horsham FC. We are always keen to hear from anyone who might be able to help fill the gaps in any of our records, or who might have any memorabilia you think would be of interest to supporters, and would invite you to email Mark if you can help. We would also like to thank the following for their assistance in putting this database together: Chester Browton, Ian Dunscombe, Peter Tanner, Mike Wilson, Dennis May, the late Peter Wilkins, Ian Hands, Nigel Smithers, Terry Browne and everyone who has provided match reports over the years.